You love your backyard. It’s a place where you can find solitude one day, and invite your friends for a barbeque the next. At the same time, your backyard requires a lot of work to keep its appearance. And that work requires a lot of tools and equipment such as shovels, trimmers, rakes, weed killers, clippers, buckets, leaf blowers and much more. If you don’t have a shed, these tools can end up around the yard or take up space in your garage. Buying a custom Amish shed or a garage is an affordable and practical solution to this problems. It will also add value to your home that will stand to make the payout that much more when it comes time to sell. 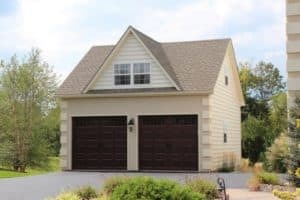 Thinking about buying a custom Amish shed or investing in an Amish garage? Let us show you why All Amish Structures is the best way to go. Your garage has its designated purpose. It’s where you have your workbench and keep your car looking shiny. There’s really no need to be cluttering it up with all your yard equipment and tools. You could end up scratching your beautiful car or leaking oil onto your garage floor. By adding a custom Amish shed to your home, you’ll be able to leave the garage to the business it was meant for. Too many of us keep hazardous materials such as fertilizers and weed-killers, in areas that are potentially accessible to our children or pets. By getting these products outside of your house and garage, you stand to reduce the risk of a mishap. A custom Amish shed can be kept under lock and key as well, just to add the extra layer of security and peace of mind. Buying one of our popular Amish sheds will increase your property value. The truth is, a well-crafted, professionally built Amish shed is a very desirable feature to potential homebuyers. And you get to enjoy the convenience that it provides until the day finally comes when you do sell. It’s an investment that has a day-to-day benefits. When you’re in need of quality Amish sheds or garages, there’s only one name you need to know. All Amish Structures. We are the leading providers of Amish structures in PA and New Jersey. Count on us for the best prices, the best quality, and the best service.